"Last And Greatest Of All"
No doubt a gaggle of children hung around the grandmas, aunties, and mothers supporting Jesus out of their own means (Luke 8:1-3). But the children hold little interest to the Gospel writers except here. 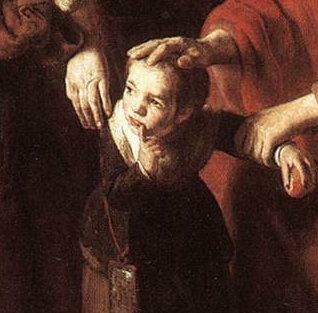 Did Jesus play and joke with the children? Did he listen to their dreams and nightmares early in the morning? Did he commiserate with the injustices and frustrations of childhood, and, particularly, life on the road? Did he allow himself to see life through their eyes? Did he tell them special stories? Did he allow them to climb into his lap and fall asleep at nap-time? Did he slyly reverse the power dynamics over children with a word here, a wink there, a protective or loving gesture? I'd like to think so. Meditation Three invites us to avoid the danger of sentimentality, and to look at structures of injustice. Further, your meditation may take you toward consideration of refugee children around the world and on our borders, as well as child soldiers, victims of child trafficking, exploitation, war, preventable diseases, domestic abuse and neglect. Please pay attention to Bonhoeffer's comment (The Last Word). It is the devil’s greatest triumph when he can deprive us of the joy of the Spirit. He carries fine dust with him in little boxes and scatters it through the cracks in our conscience in order to dim the soul’s pure impulses and its luster. But the joy that fills the heart of the spiritual person destroys the deadly poison of the serpent. But if any are gloomy and think that they are abandoned in their sorrow, gloominess will continuously tear at them or else they will waste away in empty diversions. When gloominess takes root, evil grows. If it is not dissolved by tears, permanent damage is done. It is beyond dispute that a child, even before it begins to write the alphabet and gathers worldly knowledge, should know what the soul is, what truth is, what love is and what forces are hidden in the soul. It should be the essence of true education that every child learns this and in the struggle of life be able more readily to overcome hatred by love, falsehood by truth and violence by taking suffering on itself. In a poem by Rumi, a young man seeking advice asks to speak to someone wise. The villagers point to a man playing stick-horse with children. “He has keen, fiery insight and vast dignity like the night sky, but he conceals it in the madness of child’s play.” During their conversation the young man asks the wise man why he hides his intelligence. The man answers, “The people here want to put me in charge. They want me to be judge, magistrate, and interpreter of all the texts. The knowing I have doesn’t want that. It wants to enjoy itself. I am a plantation of sugarcane, and at the same time I’m eating the sweetness.” The following words are from the middle of the poem. Knowledge that is acquired is not like this. Those who have it worry if audiences like it or not. It’s a bait for popularity. Disputational knowing wants customers. It has no soul. Robust and energetic before a responsive crowd, it slumps when no one is there. Chew quietly your sweet sugarcane God-Love, and stay playfully childish. Your face will turn rosy with illumination like the redbud flowers. We are living in a time of unbearable dissonance between promise and performance; between good politics and good policy; between professed and practiced family values; between racial creed and racial deed; between calls for community and rampant individualism and greed; and between our capacity to prevent and alleviate human deprivation and disease and our political and spiritual will to do so. 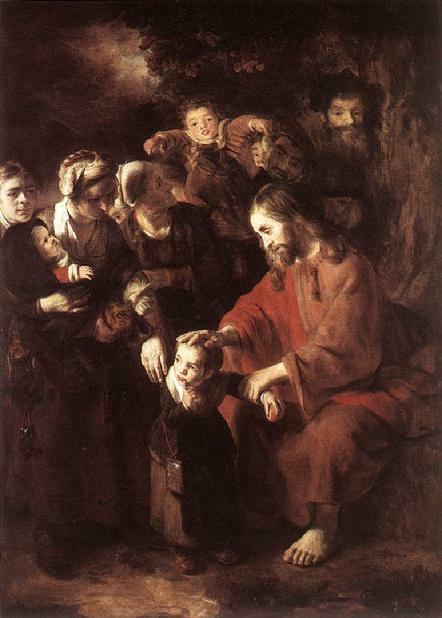 I find Nicholaes Maes’ Christ Blessing the Children humorous because the children are oblivious to the occasion – notice the child lifted above the crowd going limp with resistance. The child in the foreground represents the state of my soul. The hand of the King of Kings, the Lord of Lords, the Light, the Word, the Good Shepherd, the Gate, the Resurrection and the Life, The Paschal Lamb, son of the Queen of Heaven, son of the Most High rests upon my head, blessing me. But I'm attentive to some movement in the crowd, another child's misbehavior or clowning. Or I'm absorbed in my own daydreaming, usually of more interest than what's happening to me or around me. But who can blame me for this? I'm a three dimensional being, a mere child in the ways of wisdom, and the Holy One reaches to me from behind time from the eternal present. How can I possibly know how deeply I am blessed? In the following Rumi poem the poet acknowledges this same trait of distraction. However, he wakes up and realizes his place as an honored guest, playing the music of his life for his Host.